"Burlanes were recommended to us by friends after a couple of bad experiences with other companies. 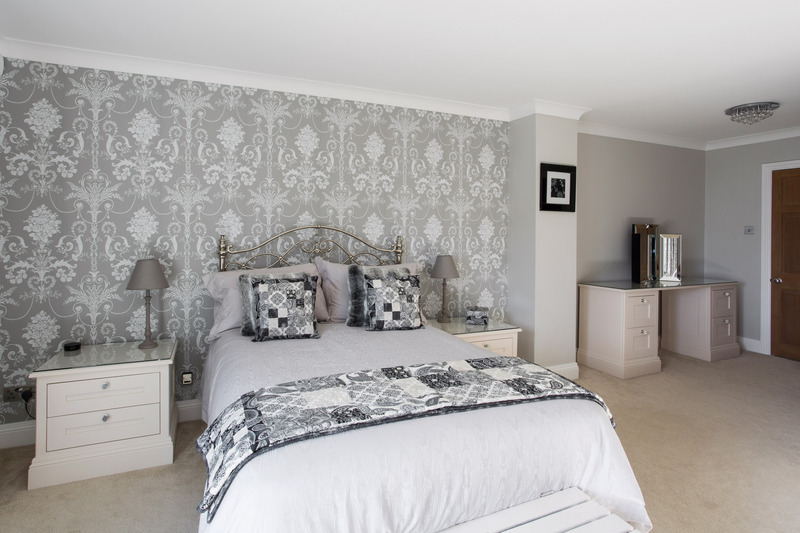 As soon as we met Lindsey we were hugely reassured that we had made the right decision, she gave great input and advice to help us create our bedroom and en-suite. Her expertise in design was matched by the quality of work delivered by the team, and we are delighted with the end product. We also love the fact that the aftercare and follow up has been excellent. We would absolutely work with Burlanes again, and would recommend them to anyone else looking for a professional and quality finish." Sitting proud up on the hill overlooking the coastline in Hythe, this family home is simply stunning. Bought as a total renovation project including building and landscaping works, the house has been transformed into a beautiful sophisticated family home with so much charm and charisma. 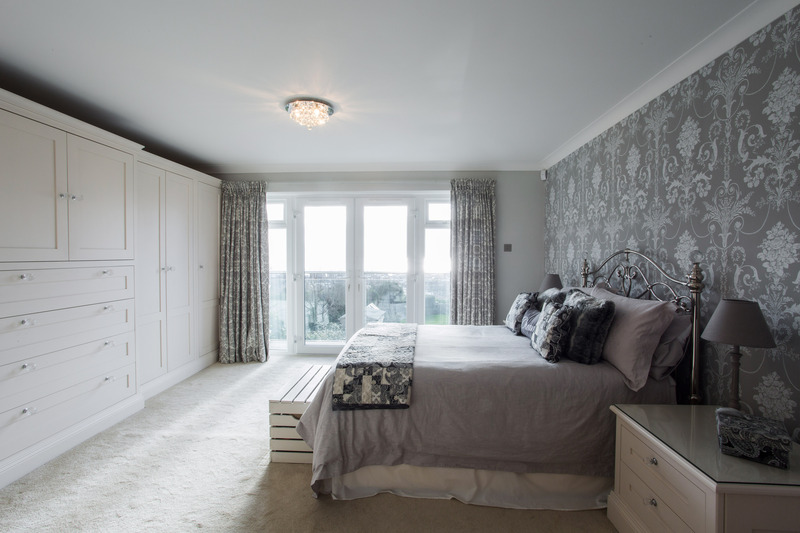 As part of the renovation project, Burlanes were commissioned to create a serene and chic master bedroom and en suite, with handmade fitted furniture and lots of storage space. With such large french doors opening up to a glass balcony with a beautiful sea view, the room is flooded with natural light. 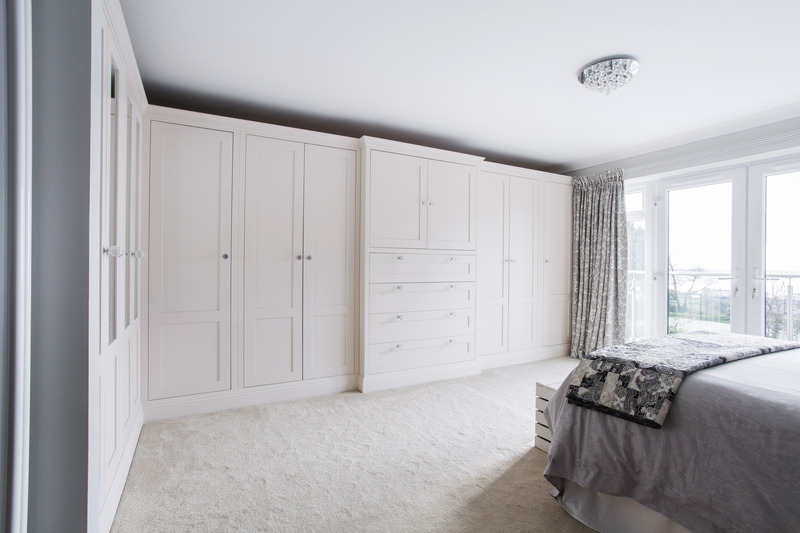 Accompanied with the light tones and textures of the walls, carpet and upholstery, our handmade fitted wardrobes, handpainted in Mylands 'Charterhouse' reflect light around the room, creating such a calm and serene atmosphere. 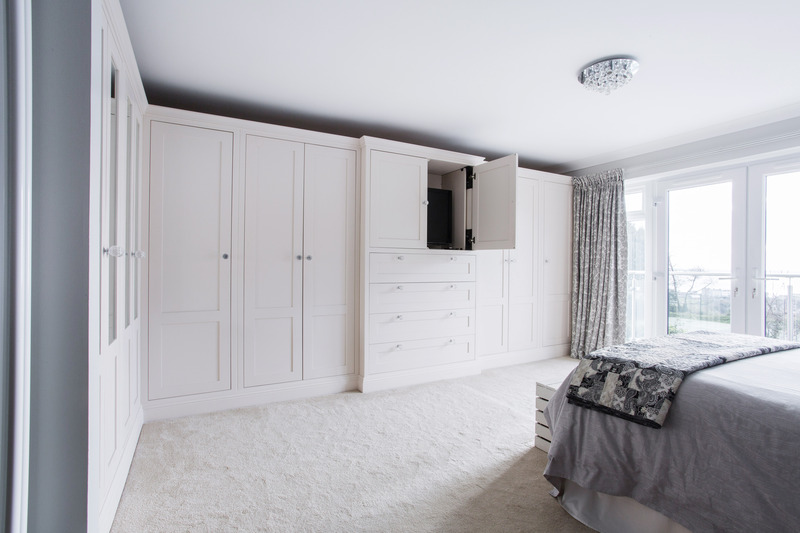 The homeowners wanted to keep their master bedroom sleek and clutter free, so wardrobes with lots of storage space were a must. 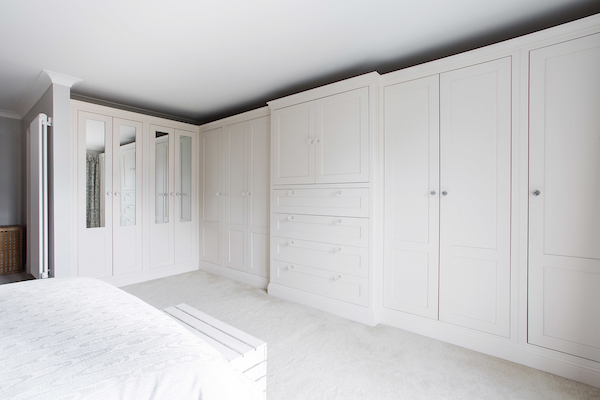 Floor-to-ceiling fitted wardrobes are a classic style, and handmade, bespoke high quality furniture is timeless. 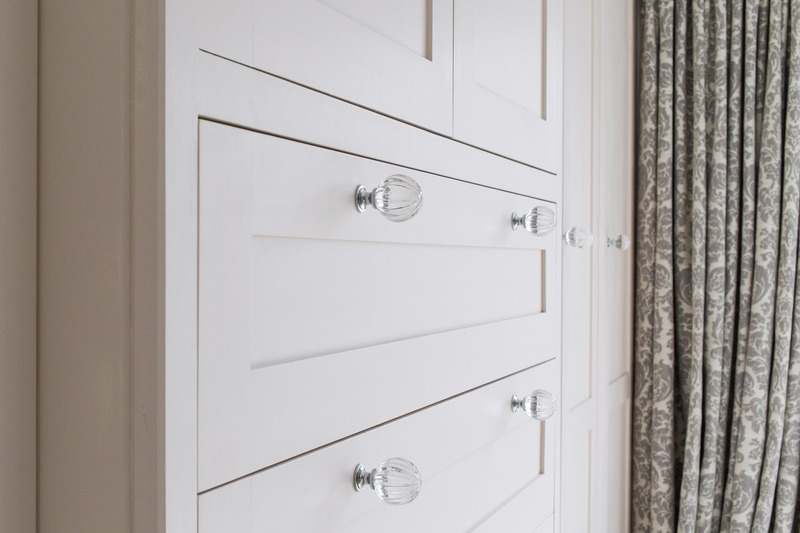 Our design team created beautiful panelled wardrobe doors and drawers, with crystal handles in keeping with the chic styling of the bedroom. Mirrored wardrobe doors not only provide a purpose, but also allow light to reflect and bounce around the room. The homeowners wanted to keep their television within their bedroom, but in a space where it could be hidden away from view when not in use. 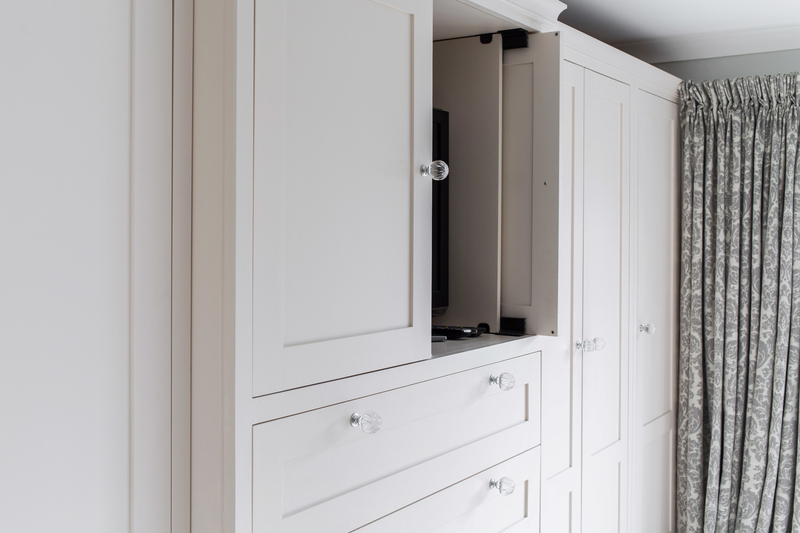 Our design team incorporated an easily accessible space for the television, with bespoke hinged sliding doors, allowing the doors to slide into the wardrobe unit when the television is in use. 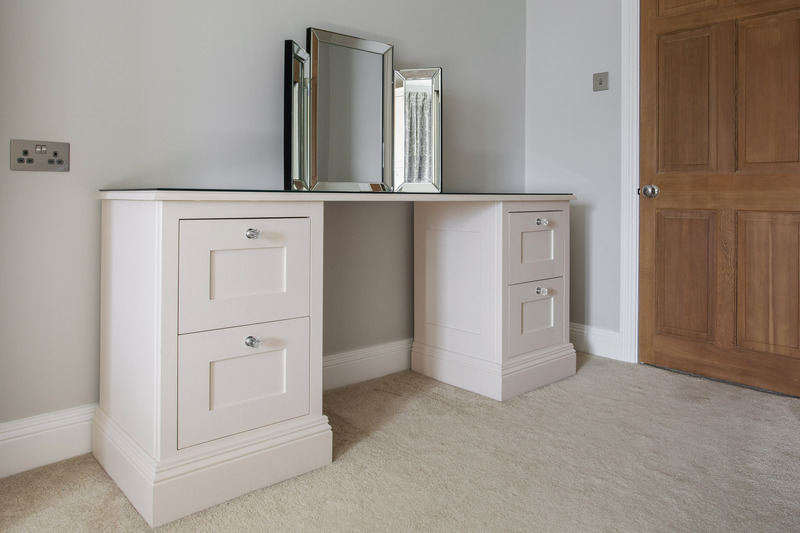 As well as the fitted wardrobes, our design team created beautiful bespoke bedside tables, and a stunning glass-topped dressing table to complement the chic styling of the room perfectly. 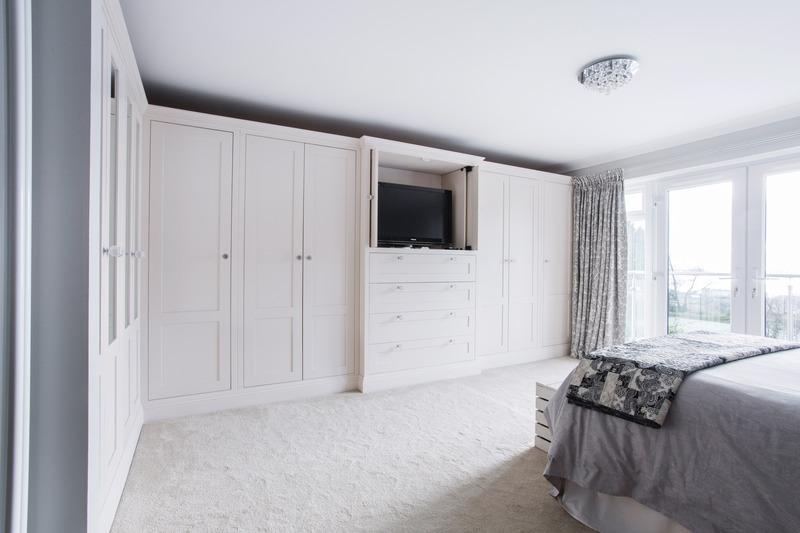 In keeping with the look and style of the wardrobes, the bedside tables are wide with deep drawers to maximise available storage space, and the dressing table allows for lots of storage space too. 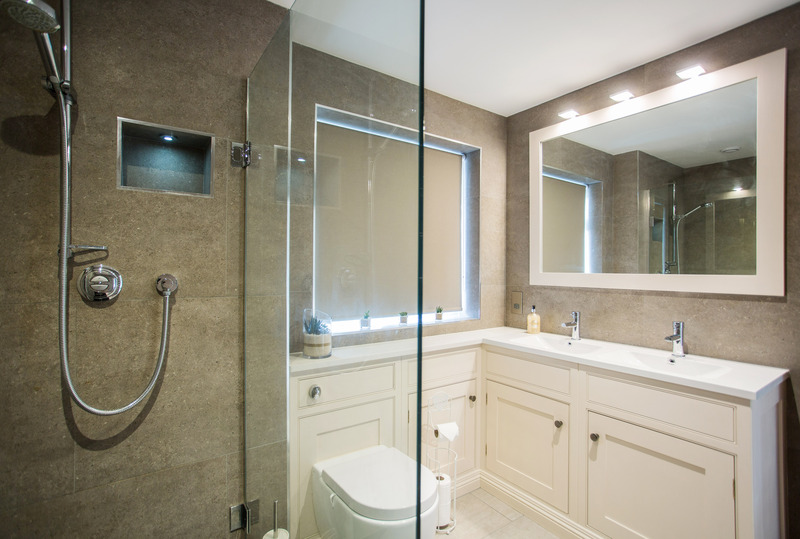 A must-have for a chic master bedroom is an accompanying en suite, and Burlanes were commissioned to design and create an en suite bathroom in keeping with the streamlined and clutter free style of the bedroom. 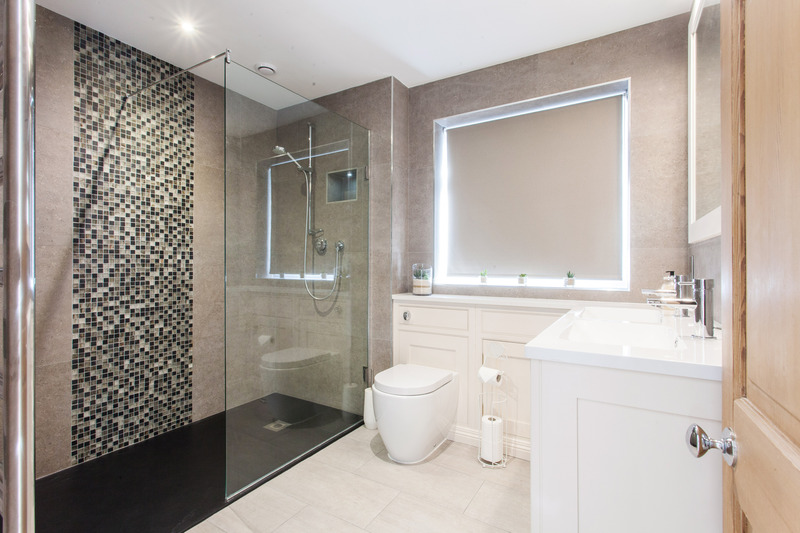 The homeowners wanted an open, walk-in shower area, which our design team created with floor-to-ceiling glass shower screen, and a beautiful mosaic tiled panel in 'Yantze' by Silver Lion, creating a feature wall. We also created a bespoke niche in the wall, with spotlights, for storing toiletries at easy reach. With ample space to work with, our design team were able to create a luxurious spa retreat for the homeowners, with handmade bathroom cabinetry handpainted in the same Mylands 'Charterhouse' as the bedroom furniture, with Minerva worktop in 'Ice Crystal'. The wall tiles in 'Concept' by Ca'Pietra are in keeping with the neutral neutral colour palette of the room. 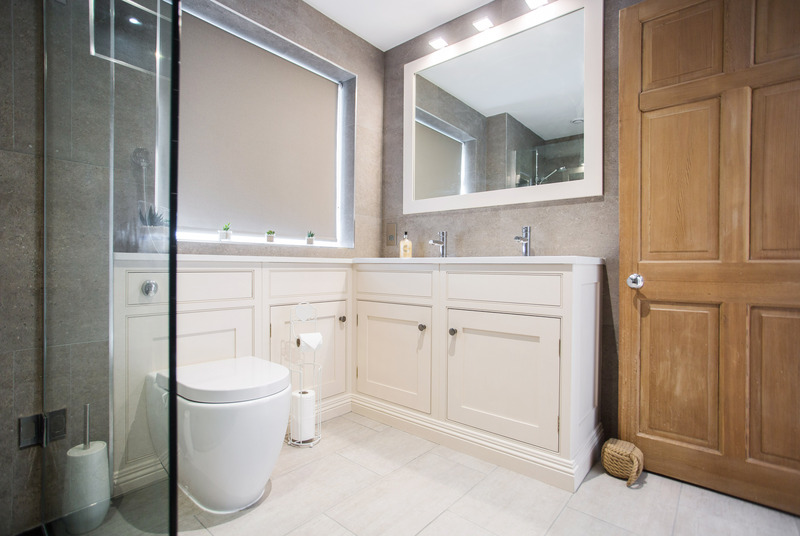 Complete with 'his & hers' matching wash basins, the bathroom cabinetry was designed and handmade at a bespoke depth to conceal the toilet cistern and provide lots of storage space, with bespoke shelf heights.